The easy and affordable solution for dye sub paper transfer applications. There’s an integral cut bin for catching cut pieces to keep them clean. The ThermTX TTX series has been designed with ease of use in mind. The six mandrels make loading and unloading the media easy – no tools required. Cores are easily positioned directly onto a spring-loaded mandrel for accuracy and ease of use. The unwind mandrels include a material centering system which allows the user to quickly and accurately load the calander for production. The Therm TX 64” and 75” TTX units have been engineered to provide a safe working environment for operators, with a number of safety features built-in. There are two emergency stop buttons, easily accessed from the front or rear of the calander. Once a safety feature has been activated, the user must press the reset button to restart the calander. All the exposed surfaces have been thermos isolated to protect the user from the risk of burns, and when turned off, the ThermTX heater drum automatically shuts down when safe temperatures are reached. The table is in a fixed position, allowing for both roll-to-roll or piece production. This makes it ideal for the production of sportswear and garments using stretchable or non-stretchable fabric with cut pieces. 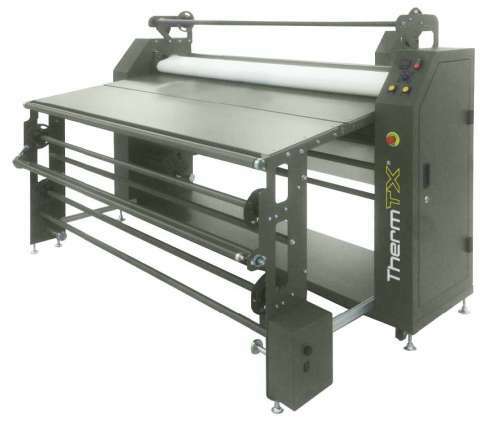 It also works with tack or non-tack transfer papers in roll-to-roll applications for signage – and it has a low speed servo-driven motor system to allow pigment ink fixation.